The Old Timers Baseball Facility at Shelby Park is a special place. The baseball field was first built in 1914 and was known for many years simply as Shelby #1. Home plate is still within 6 feet of its original location. There will be a 100 celebration in 2014 to commemorate 100 years of baseball in Shelby Park. There was an additional baseball field located at the site that was called Shelby #2. It was demolished in the sixties and was replaced with a softball complex that was utilized until 2010. The softball complex has since been replaced by a special events lawn and a second baseball field similar to the existing field. The second baseball field will be completed in 2013. Until the 1980's the infield was skinned with no infield grass. An old backstop with a screen top covered home plate until the current backstop was constructed. Turf grass was added to the infield and sidelines. Most area high schools over the years have played at Shelby at some point and there's a district high school tournament played each spring. Amateur summer leagues such as the Larry Gilbert League, Babe Ruth league, American Legion and adult leagues like the City League and Tri-state League flourished there in the 40's, 50's, 60's and 70's. We have pictures of games from those years where 400-500 people were in attendance for a big rival game. Dave Whitten, long-time head coach of Belmont University, brought college baseball to Shelby after Whitten field was demolished on the Belmont campus. Belmont continued to play at Shelby until 2011. Shelby has also seen its share of professional players. Countless numbers of former and future players have come to Shelby to play. Several well known major leaguers like Ken Griffey, R.A. Dickey, David Price, Orestes Destrade, Wayne Garland and many other big leaguers all have played at Shelby prior to or even after their careers. 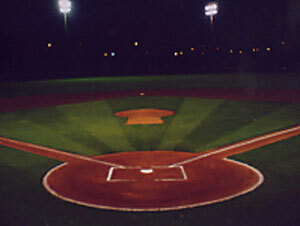 The Nashville Old Timers Baseball Association took over operation of the field in 1990. The Stan Musial Southeast Regional tournament was hosted at the facility by the Old Timers for several years. During that time many improvements were made to the field and facility by the Old Timers. The facility continues to improve. The clubhouse interior has been remodeled and refurnished. A full metal outfield wall, a windscreen for side fences, winged foul poles, and fence cap have been added. Additional lights, in-ground water sprinklers, two batting cages, double mounded bull pens, a new PA system and scoreboard have been installed. New dugouts have been constructed along with a garage and storage barn for field equipment. Centurian Stone was added to all the structures to improve the appearance of the park. Several high schools and a few colleges on spring trips use the field each year for games. The SANDLOTT Mid-State League and many tournaments including five SANDLOTT World Series fill the summer schedule with over 300 events taking place on just one field each year. ESPN was impressed enough with the facility to film a 2004 ESPN mini-movie at the park. Farmers Insurance and the U.S. Army also used Shelby as a backdrop for their commercials. The Nashville Old Timers Baseball Association has opened the Junie McBride Hall of Fame Room on the upper floor of the clubhouse where members of the Old Timers Hall of Fame are honored along with Nashville major leaguers, Old Timers Past Presidents and other honored baseball players. Many old pictures and memorabilia from years gone by decorate the walls. We know many families that have watched three or four generations of their family play baseball at Shelby Park. The hundred-year-old trees that surround the field, the Cumberland River (with several daily appearances of the General Jackson Showboat), the moan of the freight trains as they rumble across the 100-foot-tall trestle, the splash of the fountains in the park lake, all add special atmosphere to a night of baseball. If you haven't been to Shelby lately, you are missing out. Take a trip down memory lane and see a baseball game at a very special place - beautiful Shelby Park.